Day 289: Fathers Are Home Grown . . .
Ah, Sunday – and what a special one it is. Today isn’t just any Sunday – it’s Father’s Day. . . which for the record rates right up there with most national holidays. Fathers are pretty darn special people – some guys are birth fathers and some guys regard children that come into their lives as their own . . . in both cases any man who takes on the responsibility for raising a child is awesome. Today was a busy day leading up to a great Linner (late lunch, early dinner) with both Brian and Jean’s Dad, Bill around the table. Daughter #1 and Bruce Wayne rounded out the participants and a great time was had by all. Prior to enjoying some grilled steaks, roasted potatoes, asparagus and sautéed mushrooms, we spent the late morning into early afternoon powerwashing the Bondy Deck – think we are going to discover quite a few unused muscles protesting when we awake in the morning. Must admit, it does really look nice – now we just have to figure out about staining it . . . sounds like a visit to Home Depot is in the making! For the record, we love, love, love Home Depot and given the dollar amount of purchases over the last 30 years are pretty sure they love, love, love us as well. 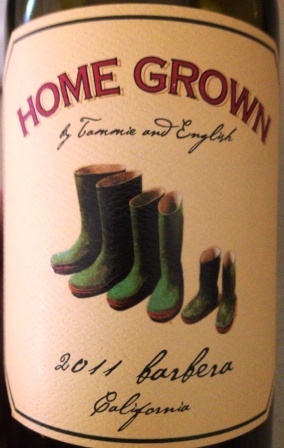 Ok, no hogwash: we created Home Grown Farms because we wanted an everyday table wine with some soul. We felt an obligation to rescue the American week-night wine from its castration-by-corporation and bring it back to the farm. It’s SO HAPPY here!! You should see the smile on its face and the trot in its boots. . . And now that it has rolled around in the the sweet hay awhile, we’re ready to share it with you: weeknight wine with a little mud on its shoes. Family-style, folks. The wine equivalent of a warm blanket or a deep belly laugh. Because things are just better when they’re Home Grown. After all . . .even Elvis went on the air in a shirt that his mother made . . .
As usual, we digress – the wine was really fun. Not too much of a nose – but very nice and fruity on the palate and finish. It wasn’t a heavy wine, more to the light side – but not too light. Really hard to put into words – just an overall good wine. All around the table agreed that it did open up and get more of a backbone and shook off its skinny legs for some “been at the gym” ones. We also all agreed it would make the Bondy Deck Wine list, but maybe not the Top Ten. Would we buy again – YES! In fact, we have to buy at least five more bottle so we can participate a giveaway we found on their website – Redeem your corks! While we’re making our Home Grown out on the farm, we sometimes get to thinking some deep thoughts, you know, like the meaning of life, or the smell of a peach, or the size of pumpkins in Kansas. We’ve written our best guesses at Life’s Great Mystery (and how it relates to wine) on 9 of our corks. As you enjoy the nectar of Home Grown”s Family Harvest Red, you can ponder our musings. Then, put them in a drawer. Because if you collect six of them (6 different ones) we’ll send you a Home Grown Farms t-shirt. And, once you are wearing your t-shirt and feel inspired to do your own navel gazing, hop over to the box on the right and submit your own home grown philosophy of life. As we wrap up another Father’s Day – be thankful for yours . . . regardless of the situation – remember although you may think he is Superman . . . he is just human – but, always there for you whether in person or in spirit. He gave you life and you are part of him – embrace him and all his goodness (and sometimes not so goodness). Remember to tell him you love him – he’ll hear you wherever he is. As we raise a glass to toast father’s everywhere, remember to enjoy responsible and recycle whenever possible. Categories: Uncategorized | Tags: Father's Day, Home GRown Family Harvest Barbera, Home Grown Farms | Permalink.